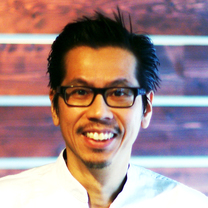 Chef Ng received training in traditional Japanese cooking and ramen making for 7 years while obtaining his Bachelor of Architecture degree. "Wonderful dinner @shane_oporto and the team for the hospitality! Great food haven in St. Paul!" "A Shack burger for my guilty pleasure! #homealone"
"Excellent food @italianeatery! You will see me more often now!" "Such an Incredible dinner @#datenight"
"Aka Niku (Red Pork Belly)- Aka Miso, Gochujang, Fermented Red Rice Koji Bean Curd #豚のバラ肉"
"Light, herbal, & a kick of heat with 12 hours Five Spice Braised Beef Nagoya Taiwan Ramen this weekend! #台湾ラーメン"
"Romanesco, Ume, Clove, Onion Essence." "Gyokai Infused Shoyu Duck Breast. #鴨"
"Honey Shoyu caramelized Pork Shoulder with Chinese Shaoxing Rice Wine." "Seasoned Soft-boiled Egg, Thin Wavy Noodles, Tender Pork Shoulder, a true testament of classic Shoyu Ramen. It's just so damn good!"